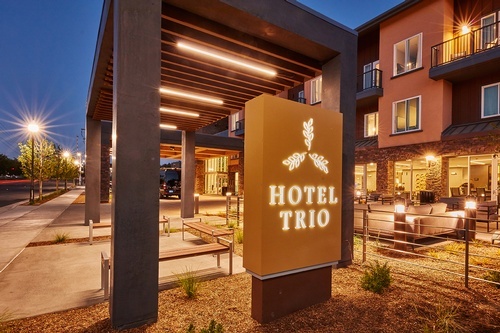 Hotel Trio is a brand new hotel that offers travelers the best of both worlds: a stylish hub for exploring wine country and a warm setting to unwind and reconnect with family and friends. Taking cues from our celebrated surroundings, Hotel Trio is an enticing blend of convenience and character, a base camp for tourists, wine industry pros, groups, and all those who seek to enjoy the best of Sonoma County. Warm, oversized accommodations with full kitchens invite guests to savor the casual elegance of wine country. You’ll find charming restaurants, wineries, tasting rooms, and boutiques just steps from our front door, along with complimentary shuttles to downtown and bicycle rentals for guests who want to explore the area on two wheels.